Melco Crown Entertainment Ltd (ADR) MPEL 2.91% are on the rise after the company reported 4Q14 earnings. 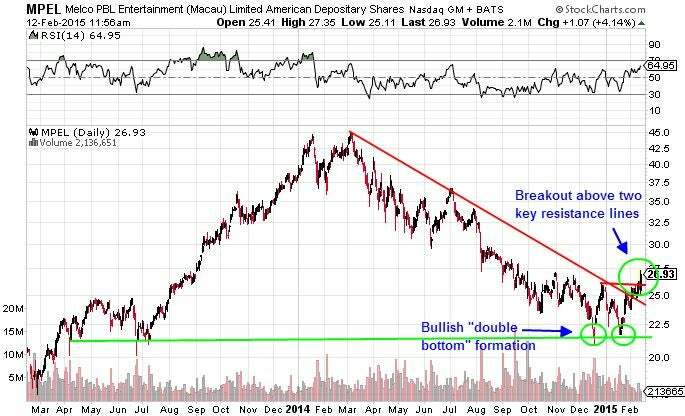 After a rough second half of 2014 for shareholders, the stock is showing signs of life in early 2014 and Thursday’s move up could signal a major technical breakout for the stock. On the surface, Melco’s Q4 numbers are far from impressive. The company reported adjusted earnings per ADS of $0.22 on revenue of $1.121 billion. Both of these numbers fell short of consensus predictions of $0.27 per ADS on revenue of $1.14 billion. Revenue for the quarter declined more than 20 percent year-over-year. Despite the top-line and bottom-line miss, the stock is up more than 4 percent in early trading on Thursday. Although the Q4 numbers for the company were bad, investors may believe that the worst of the Melco story is finally behind the company. Next quarter’s numbers will likely be boosted by City of Dreams Manila, the company’s first venture outside of the Macau market. City of Dreams Manila opened its doors in early February. While a 4 percent climb for the volatile stock is not much for shareholders to get excited about in itself, Thursday’s rise could signal an important technical breakout if it holds. After a relentless series of lower highs and lower lows that began in March of last year and continued through December, the first technical signal that the pain may be ending was the double bottom the stock formed in mid-January. The stock found support at around $21.50, the same support level it found in December and all the way back in 2013. Thursday’s move could be a technical confirmation that a firm bottom is in place for the stock, as Melco appears to have broken out above the $26.00 resistance level that halted the stock in late December. It also appears to have recently broken above the downward-sloping resistance line that has been in place since March of 2014. The rest of Thursday’s session on the next couple of days will be critical for Melco from a technical standpoint, as the stock will need to confirm a breakout by staying above the $26 level.